Many Music in the Mountains’ concerts were held in the Festival Tent at Purgatory Resort. After 32 years at Purgatory, all Festival Orchestra concerts will now be performed in the Community Concert Hall on the Fort Lewis College campus. Chamber recitals and world music concerts will continue to be offered in spaces in and around Durango. After 32 years performing at Purgatory Resort, Music in the Mountains, the area’s summer classical music festival, will change venues. All Festival Orchestra concerts will now be performed in the Community Concert Hall on the Fort Lewis College campus. Chamber recitals and world music concerts will continue to be offered in spaces in and around Durango. The 33rd season will begin July 6 and will run through July 28. The 2019 schedule of full orchestra concerts and chamber, world and pop music events will be published shortly, Beach said. 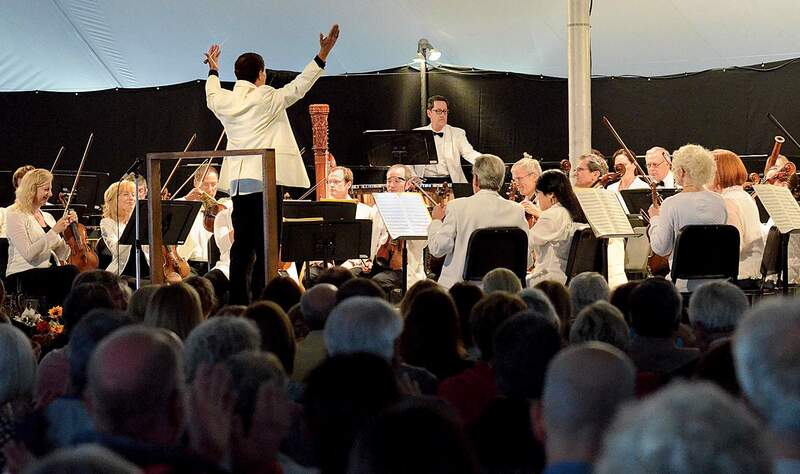 The main difference will be the Festival Orchestra’s exclusive appearances on campus, no longer 25 miles north of town in the Festival Tent at Purgatory. Long-term supporters of the festival are of mixed minds about the change in venue. American composer and patron of MiTM, Katherine Freiberger, said in a telephone interview that she will miss the mountain atmosphere. It’s how the festival started, she said. It’s a signature. Several of Freiberger’s works have been performed in the Festival Tent at Purgatory, and she said she will continue her summer pilgrimage from Dallas to Durango for the festival. By making the venue decision, organizers considered the campus location to have a proximity-to-downtown advantage. The hope, Beach said, is that concert-goers will visit downtown restaurants before and after concerts and stay in Durango hotels. Special events and smaller concerts will continue in places like Durango churches, the Sunflower Theatre in Cortez, Bayfield Performing Arts Center and Sky Ute Casino Event Center in Ignacio. For fans of Linda Mack Berven’s popular pre-concert lectures, be assured she will continue. In the past, Mack Berven gave her talks at Center of Southwest Studies whenever the Festival Orchestra played in the Concert Hall. That practice will continue, and there’s plenty of free parking.